Published Aug 26, 2014 by Que. Part of the Que Video series. In this series of video lessons, author Michael Miller shows you how to get started with Gmail for all your email needs. You’ll learn how to sign up for and navigate Gmail, receive and read email messages, create and send new messages, format your emails and work with file attachments, manage Gmail contacts, and use Gmail on your mobile device. 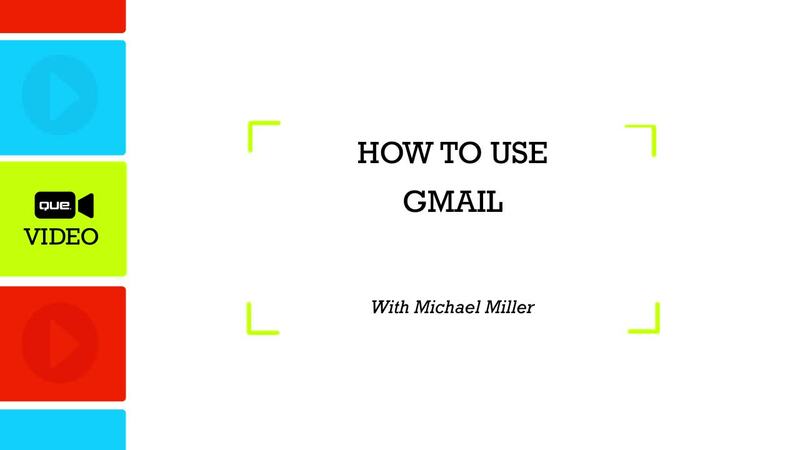 In this series of video lessons, author Michael Miller shows you how to do more with Gmail. You’ll learn how to customize the Gmail interface, manage your inbox with stars, labels, and folders, work with contact groups, work offline, and set up Gmail for use with other email accounts. You’ll also learn how to deal with spam, use Gmail to manage your tasks, chat online in Hangouts, and integrate Gmail you’re your Google+ account. Gmail is the most popular email application today and yet most people only know how to use the basics. This video will teach users how to use the basics of Gmail and the advanced features that make using email easier! How to Use Gmail teaches you how to start using Gmail to send and receive email; efficiently and effectively received email messages; manage Gmail contacts; use Gmail’s other advanced features, including Hangouts and Tasks; use Gmail on iOS and Android devices and much, much more! Michael Miller is a best-selling writer of more than 150 non-fiction books and numerous print and online articles. Collectively, his books have sold more than 1 million copies worldwide. He has also produced a number of instructional videos and presentations for Que Publishing, Alpha Books, America Online, MarketingProfs, and other companies. - Start using Gmail to send and receive email. - Efficiently and effectively manage received email messages. - Use Gmail’s other advanced features, including Hangouts and Tasks. · Basic understanding of how to use a Mac or PC computer and mobile devices.